Free tours for travelers layovers at Narita Airport. Guests at nearby hotels are also welcome! A multitude of unique Japanese experiences await you on the Narita Airport Transit & Stay Program! Which activities would you like to do while you’re here? 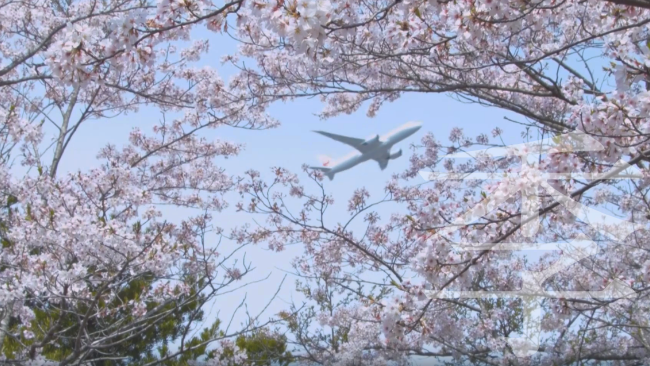 Watch our videos to help you decide, and be confident your memories of Narita are ones you’ll cherish for years to come. Seasonal changes are widely celebrated in Japanese culture, and these changes can be felt in the nature awaiting you at temples and shrines, parks and city streets, and also in the numerous festivals and other events held throughout the year. Which season will color your memories of Japan? 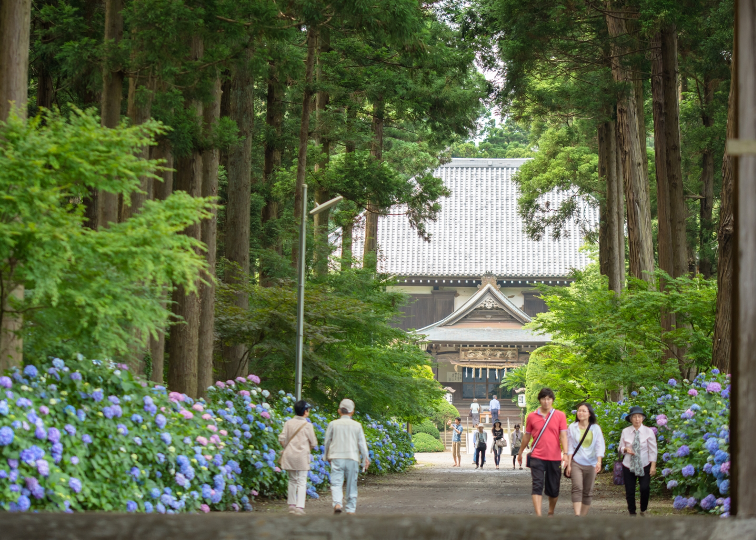 With a history spanning over a thousand years, Naritasan Shinshoji Temple is a famous and popular destination for Buddhists and tourists alike. Its reputation for granting wishes and bestowing good luck first grew in the Edo Period, after the kabuki actor Ichikawa Danjuro prayed at the temple for a son who could become his heir, and the temple’s main deity of Ofudo-sama granted his wish in 1688. 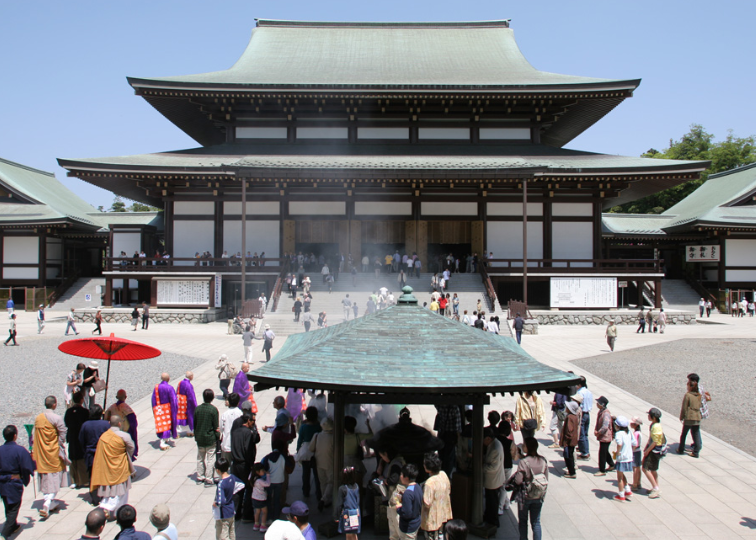 The characters in the name Shinshoji mean ‘new’ and ‘victory,’ and the temple is considered one of Japan’s most sacred places. Adjacent to the temple lies Naritasan Park, featuring a beautiful walking path, several ponds and a waterfall, and the impressive Great Peace Pagoda. 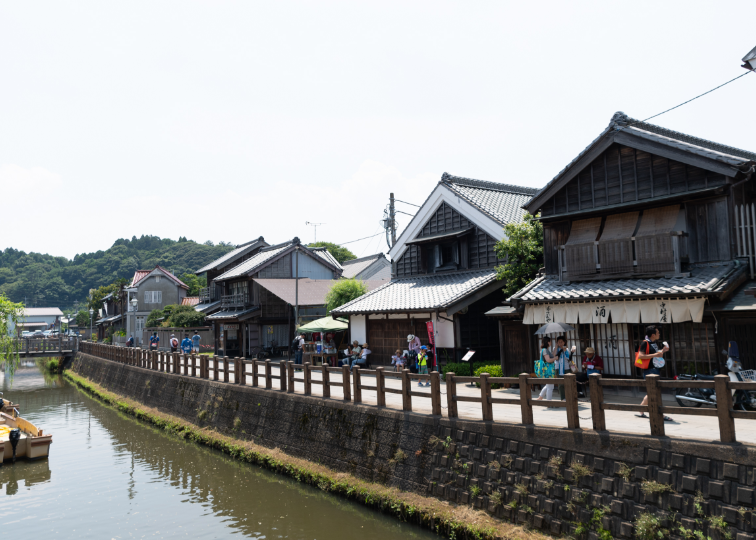 The town of Sawara allures visitors with its laid-back Edo Era atmosphere, retained from its heyday as an important commerce hub for shipping goods to the capital by water. Then used for trade, the Ono River today provides the perfect setting for a relaxing ride on a Japanese-style sightseeing boat. Another of Sawara’s top attractions is the Suigo Sawara Dashi Kaikan, which houses huge floats, called dashi*, used in the Sawara Grand Festival. Designated an Important Intangible Folk Cultural Property by the central government, the festival is held annually in July and October. *Dashi are floats that are pulled behind marchers in Japanese festivals, and may take a variety of forms, from huge figures of folklore to hoko spears. 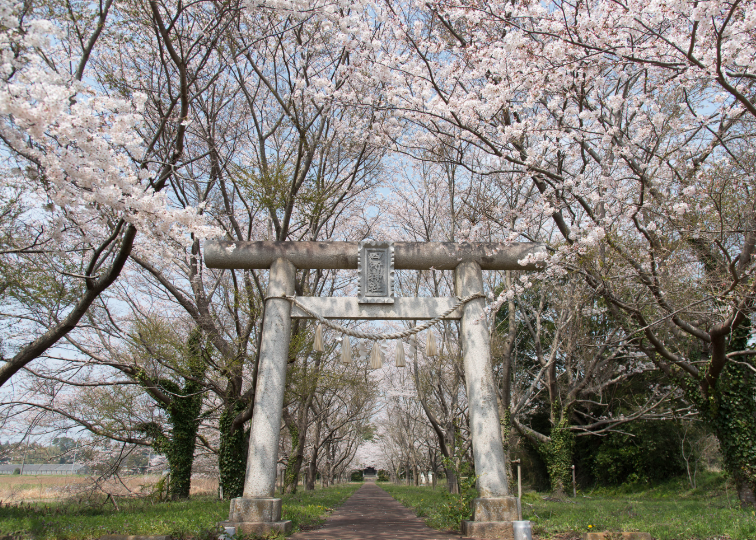 If you’re looking for places to enjoy the cherry blossoms in spring or see the colorful foliage of autumn, there are many prime locations right here in the vicinity of Narita Airport. 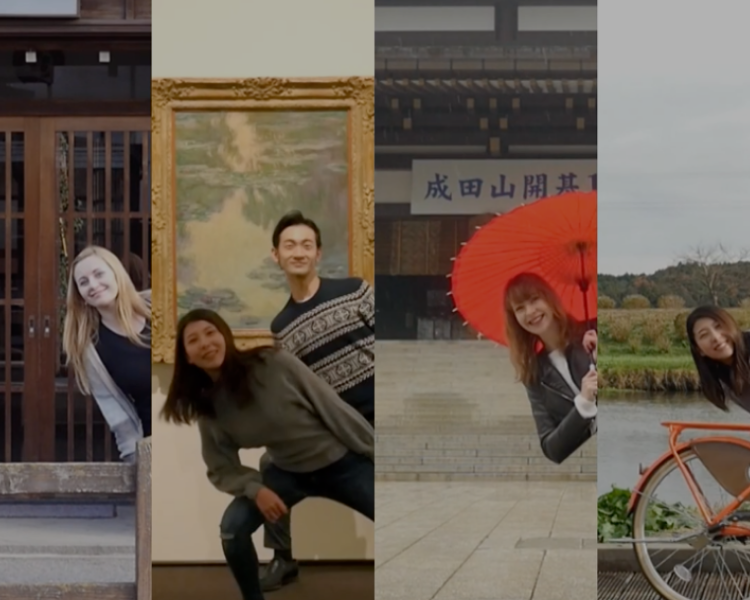 Choosing places to visit according to the season is part of the fun, and part of Japanese culture. Now, go find that special scenery! Nichihon-ji Temple in Tako Town is an important temple of the Nichiren sect of Buddhism and is well-known as being home to the Nakamura Danrin, a school for monks. Nichihon-ji is also known as the Ajisai (hydrangea) Temple: in June its wooded grounds come alive with 10,000 colorful hydrangea blooms. hibayama Nioson Temple was founded over 1,200 years ago, in Japan’s Heian Period. In the Edo Period its two black Nio statues were revered by merchants and other commoners for their power to ward off fire and theft. In the temple’s goma fire ritual, goma (homa) sticks are burned and prayers are made to Nio for protection from bad luck, the well-being of one’s family, and prosperity in business. What is goma? 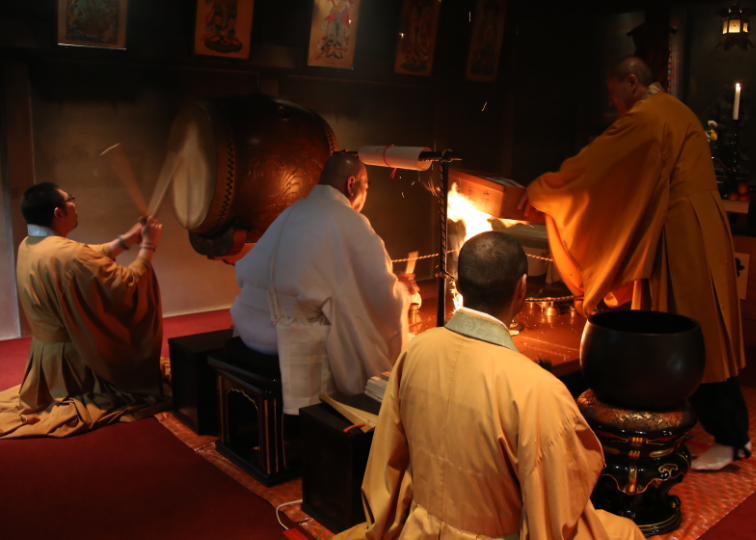 In Shingon Buddhism, goma is a fire ritual in which special sticks called gomagi are burned in a votive offering to Fudō Myō-ō (Acala) or Aizen-Myō-ō (Rāgarāja). You cannot experience Japanese culture fully without dining on Japanese cuisine. On the Narita Airport Transit & Stay Program you can try a wide variety of Japanese food, from unagi, a famous local delicacy of the Narita area, to dishes made using fresh local fruits and vegetables. You’re certain to find something you like! 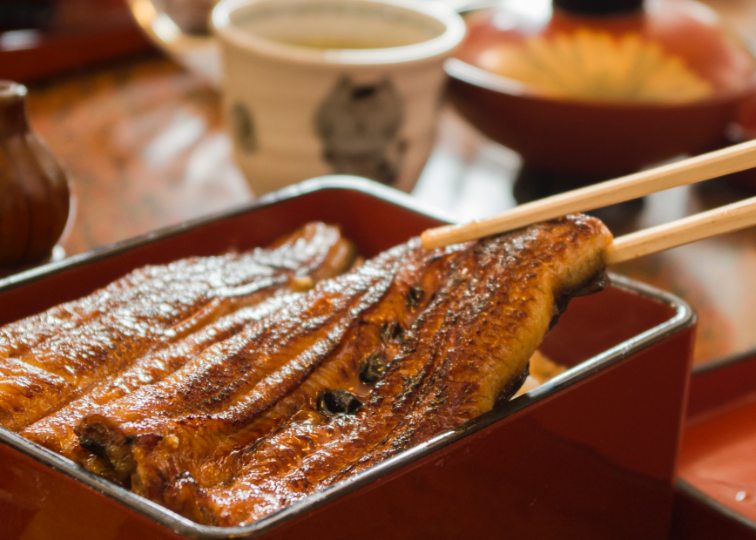 Fresh Unagi (freshwater eel) is grilled with a special sauce and served over white rice, and the delicacy's reputation for being a good source of nutrition and stamina has made it a popular choice among visitors to Narita since the Edo Period. At this famous restaurant the eel is cleaned and prepared in open view, so if you like you can watch the chefs at work. 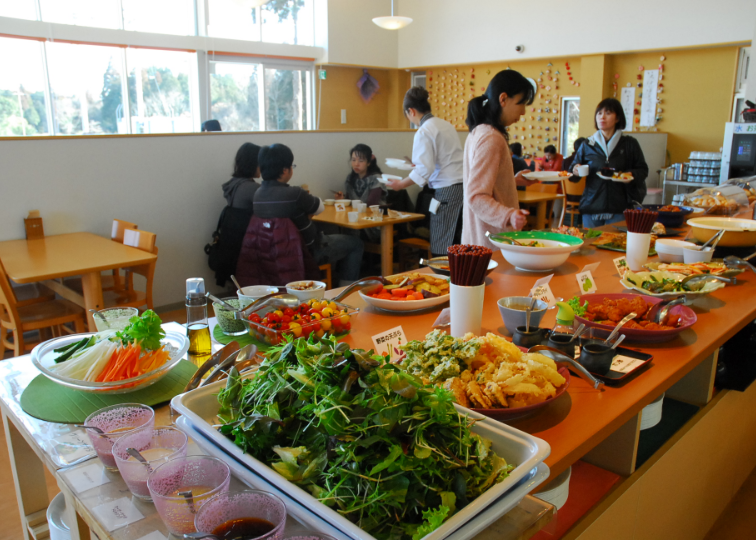 Price: approximately 2500 to 5000 yen for a meal. Restaurant Fu-wa-ri serves an all-you-can-eat buffet with dozens of home-style Japanese and other dishes, giving you an authentic taste of Japan’s food culture. 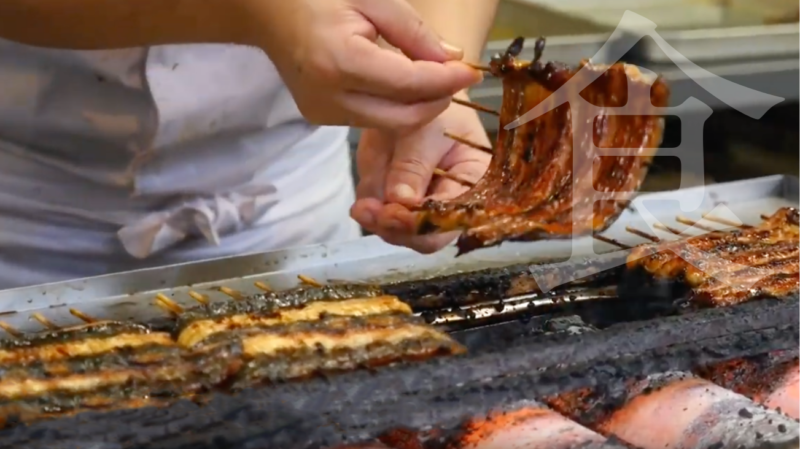 This popular restaurant is a great place to sample some of Shibayama’s local farm produce as well as specialties from other parts of the country. Narita Airport is surrounded by greenery. 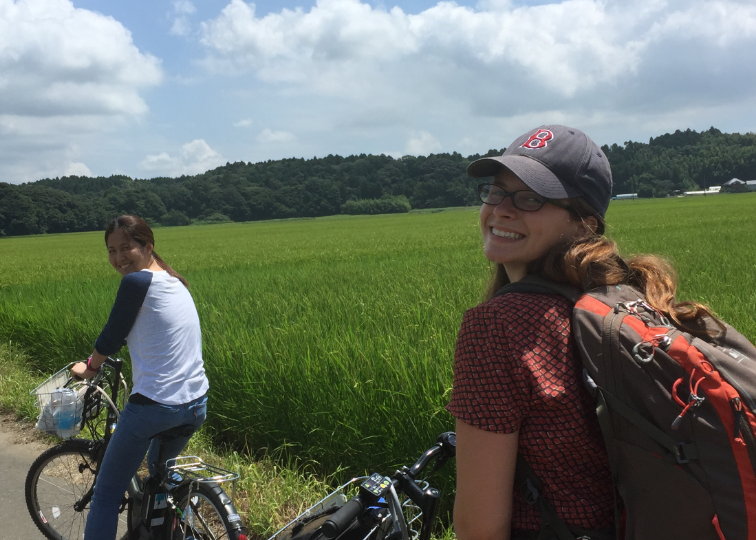 Cycle through idyllic rice fields and along the banks of a quiet river, or go for a walk in the sparsely populated countryside — how will you choose to enjoy the nature here? Power-assisted bicycles are available for rent at Roadside Station Tako Ajisai-kan, and are a fun way to tour the Tako countryside. Ride along the narrow paths between rice paddies, and then up the hill (made easy with the bicycle’s electric oomph) to Nichihon-ji Temple. Alternatively, ride along the Kuriyama River, visiting the Hydrangea Park if you wish. Rental cost for the day is 500 yen. Stretch your legs and enjoy the fresh country air as you walk from the Museum of Aeronautical Sciences to Restaurant Fu-wa-ri and its adjacent market with local produce. 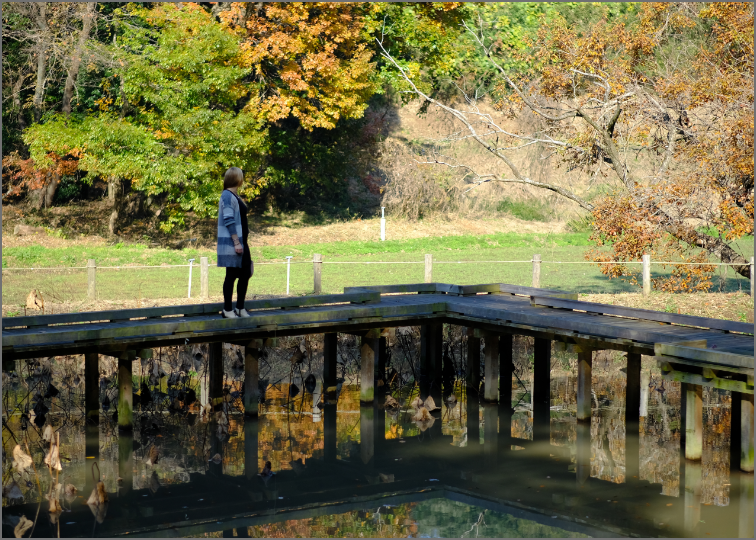 Along the way stop by the waterfront park of Mizube no Sato, where you can enjoy the seasonal beauty of the Japanese countryside. Having worked up an appetite, you’ll appreciate the buffet at Fu-wa-ri all the more. After a hearty meal, browse the local produce and souvenirs at the adjacent market. At Roadside Station Hakko-no-Sato Kozaki you can rent a bicycle for the day and ride along the banks of the wide Tone River, visiting 1,300-year-old Kozaki Shrine and the nearby Nabedana sake brewery. 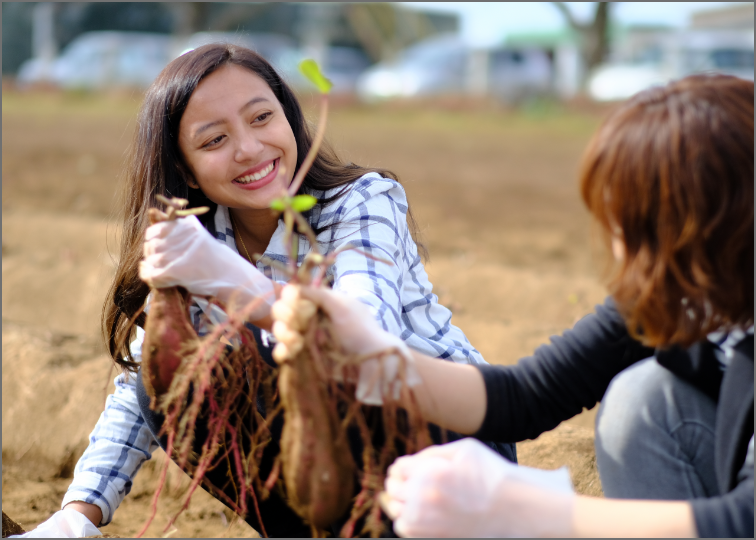 At Narita Dream Dairy Farm you can experience a little of what it’s like to work on a Japanese farm, with sweet potato digging between the end of September and mid-November, cow milking, and the chance to meet and touch many of the animals throughout the year. On the Narita Airport Transit & Stay Program you can try on a kimono, Japan’s traditional dress. 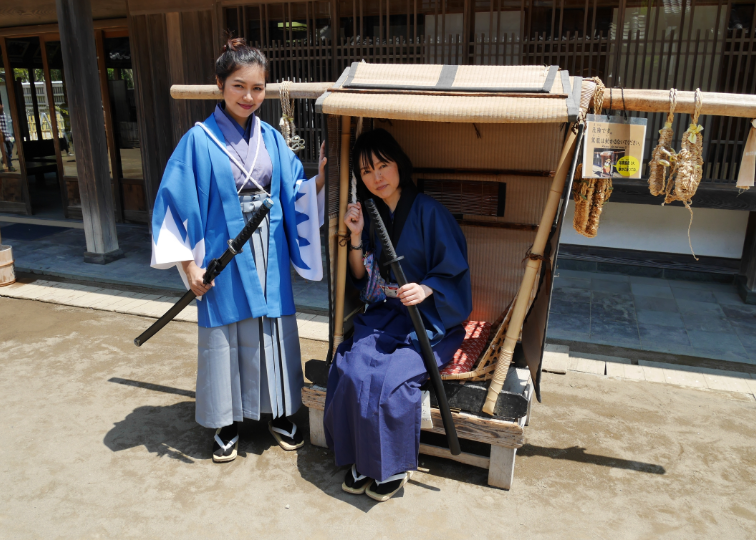 Or if you prefer, you can choose to dress up as a samurai or ninja, just like in your favorite Japanese period drama. Why not take advantage of this opportunity to transform for a day? 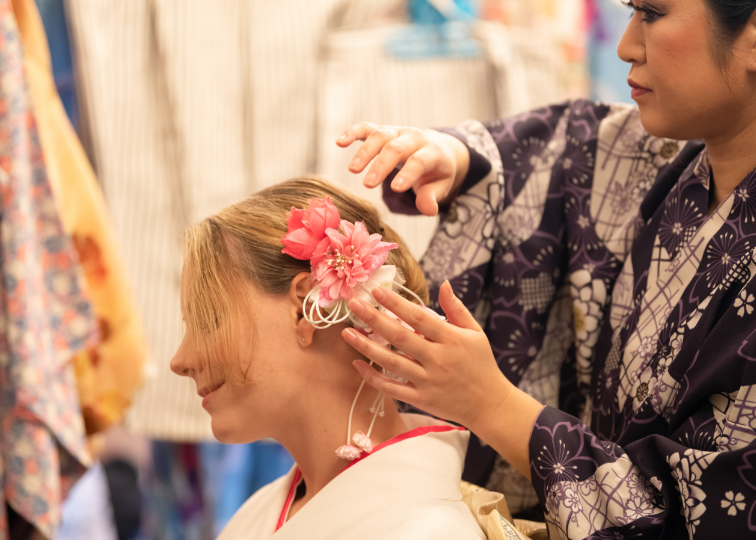 Kimono Studio HANABI will be sure you look amazing as you walk along Narita’s traditional Omotesando street, visit the important Naritasan Shinshoji Temple and enjoy a stroll through the beautiful grounds of Naritasan Park. Once the staff has you dressed picture-perfect in kimono, with Japanese sandals, bag and accessories (and as an option, professional hairstyling), smile and enjoy a professional photo shoot. Small luggage can be stored free of charge. 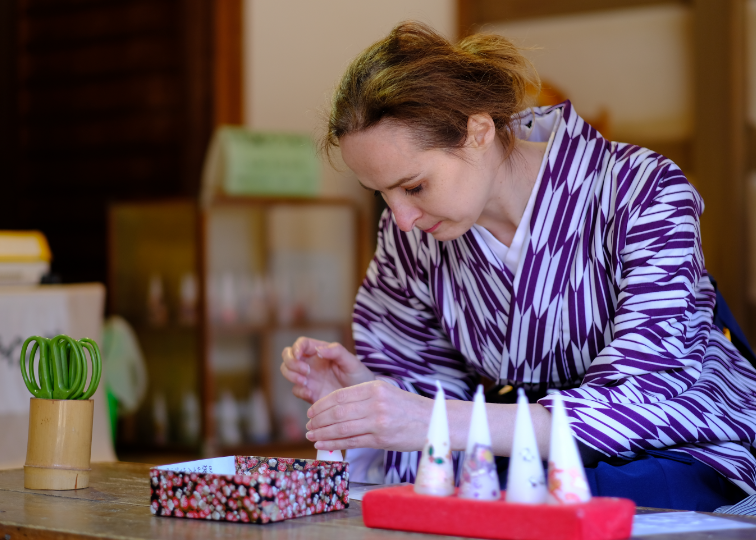 In Sakae Town, the friendly staff at Cosplay no Yakata will happily help you transform into a samurai, ninja, lady in kimono, or other figure straight out of Japanese history, and at the adjacent Boso no Mura theme park you can take part in one of several Japanese experiences, such as making chopsticks or decorating candles with chiyogami paper. Reservations for the cosplay are required and can be made by our staff on the day of your visit; when you arrive at the counter please tell us you wish to cosplay, and your preferred costume. We will check with Cosplay no Yakata and let you know if the costume is available in your size. Note: Cosplay costumes unfortunately cannot be worn in bad weather. 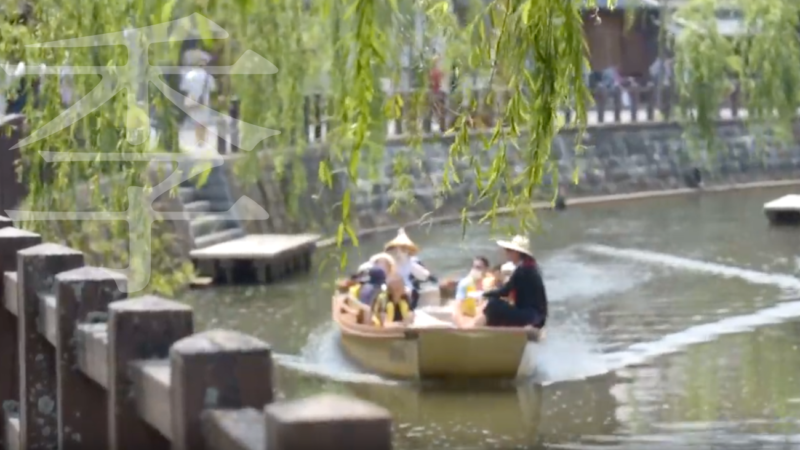 There are many different experiences to be had on the Narita Airport Transit & Stay Program, from making traditional handicrafts to touring a sake brewery, making it easy to deepen your knowledge of Japanese culture. What would you like to try? At Sakae Town’s Boso no Mura you can decorate a conical candle with colorful chiyogami* paper for a unique present or souvenir to take home. Choose from a wide variety of patterns and motifs to cut out and decorate as you like. This easy craft can be done with children as young as five, making it suitable for families as well as individuals. *Chiyogami is Japanese washi paper printed with colorful designs, often used to line small boxes or to dress Japanese paper dolls called kami ningyo. 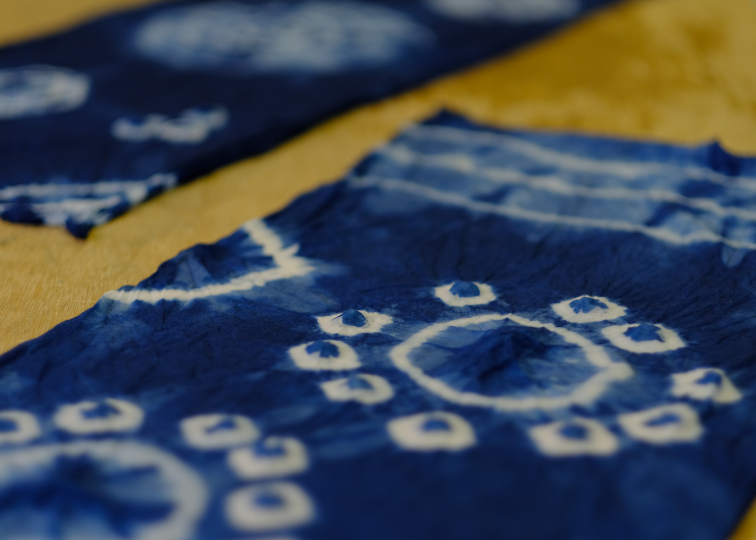 At the “Waku-waku Nishi no Jo” facilities in Kozaki Town you can try the traditional process of Japanese indigo dyeing. 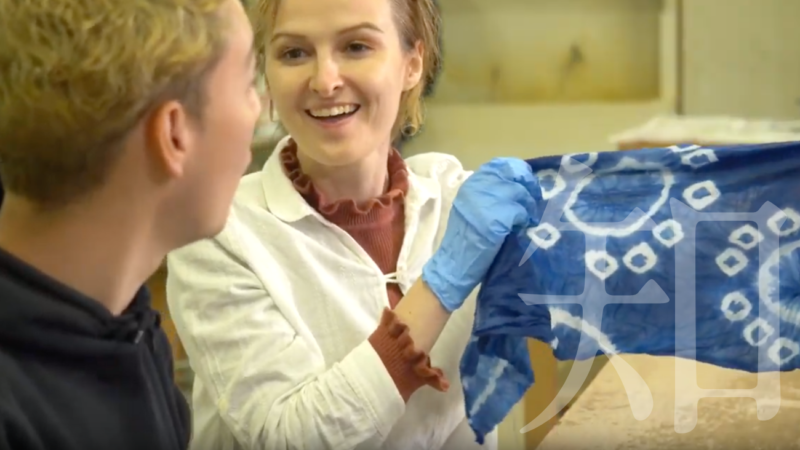 Unlike other kinds of plant dyeing, the indigo is first fermented before use. You can choose to dye any of several different items, from a tote bag to a leather keyfob. 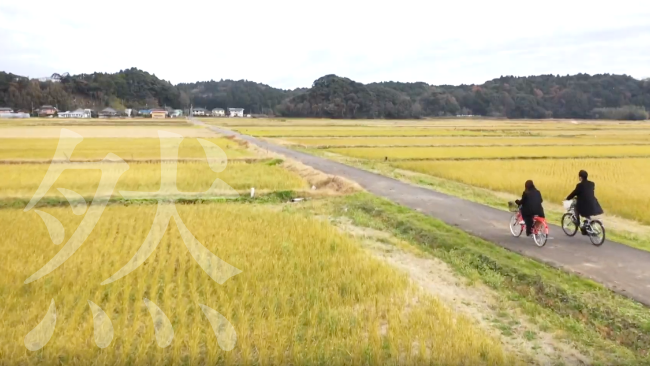 The history of sake brewing at Nabedana Brewery in Kozaki Town goes back over 300 years, and this tour will give you a great understanding of the steps involved, from the processing of rice (the main raw ingredient besides water) to the fermentation that takes place in huge tanks. At the end of the tour you get to taste freshly made sake. 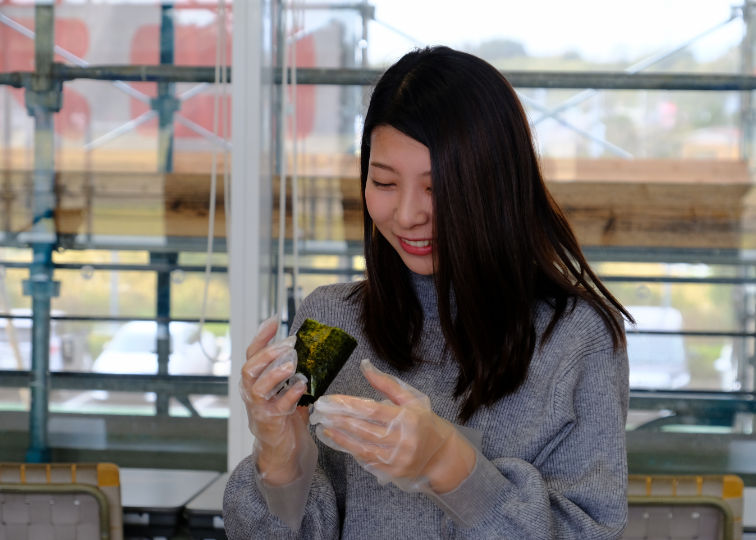 Onigiri (rice balls) and miso soup are two foods universally loved by the people of Japan, and on the Narita Airport Transit & Stay Program you can learn how to make both. 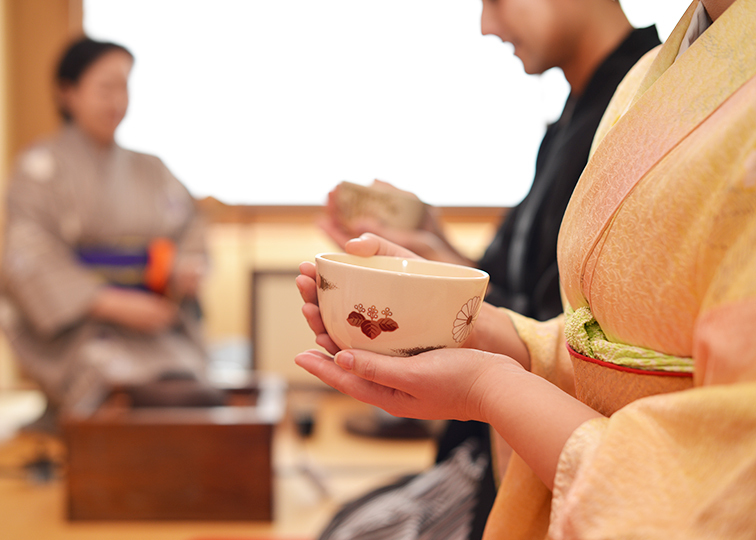 For those interested in the traditional arts, take part in the tea ceremony and learn all about omotenashi. 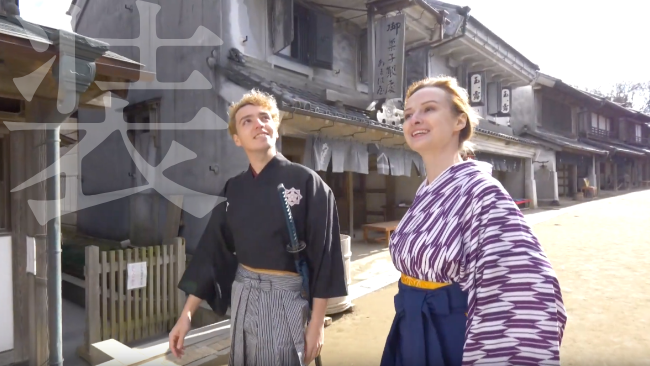 Experiences like these are sure to give you greater insight into Japan! Onigiri (rice balls) have been loved in Japan for hundreds of years as a healthful snack and convenient bento lunch. They are easy to make and a wide variety of different fillings can be used. At Roadside Station Tako Ajisai-kan you can try making your own onigiri, an experience exclusive to participants on the Shibayama Bus Tour. Side dishes such as tempura and kara-age (Japanese fried chicken) are included. A miso ball is a convenient way to make your own miso soup without relying on commercial products. They can be prepared ahead of time, and all there’s left to do is add hot water. 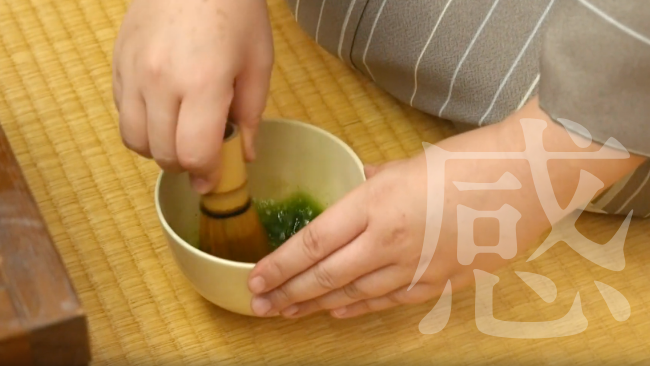 Learn how to make one yourself at Roadside Station Hakko-no-Sato Kozaki, using miso paste from locally grown soybeans and adding other ingredients. This experience is exclusive to participants on the Sawara Bus Tour. 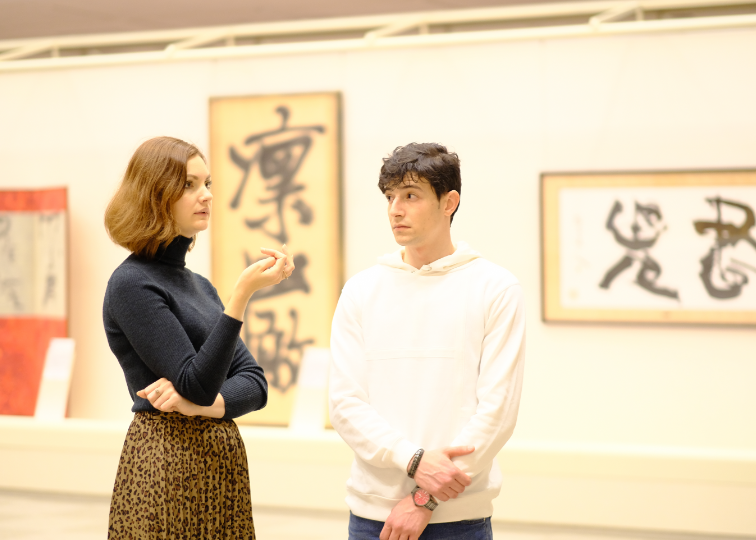 Every Thursday morning, free tea ceremony demonstrations are given with English explanations of the traditional customs and significance of many elements of this art form which dates back to the Heian Era. Held at the Narita Tourist Pavilion, located about halfway along Omotesando Street on the way to Naritasan Shinshoji Temple, this tea ceremony experience lets tourists enjoy hot matcha tea and small wagashi sweets in a tatami room while learning about the traditional Japanese tea ceremony in a relaxed environment. Schedule: Every Thursday from 10:30 to 11:30. Not held in January. 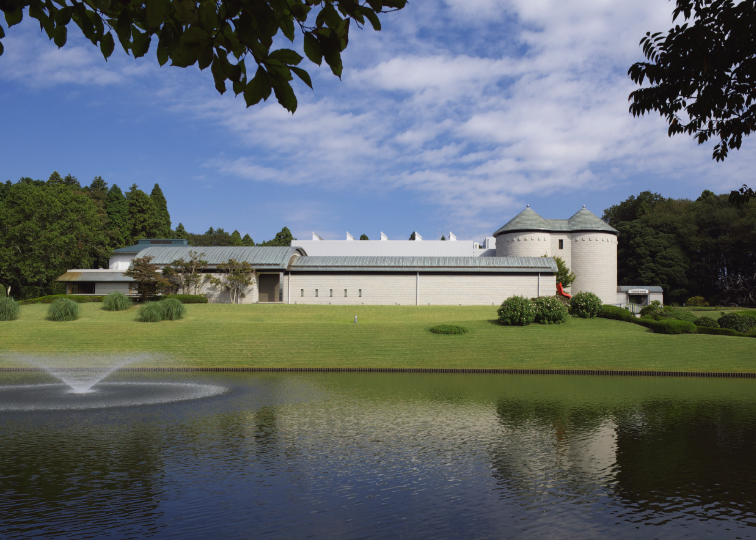 For those interested in art, the Narita area has museums with celebrated paintings and calligraphy to admire. 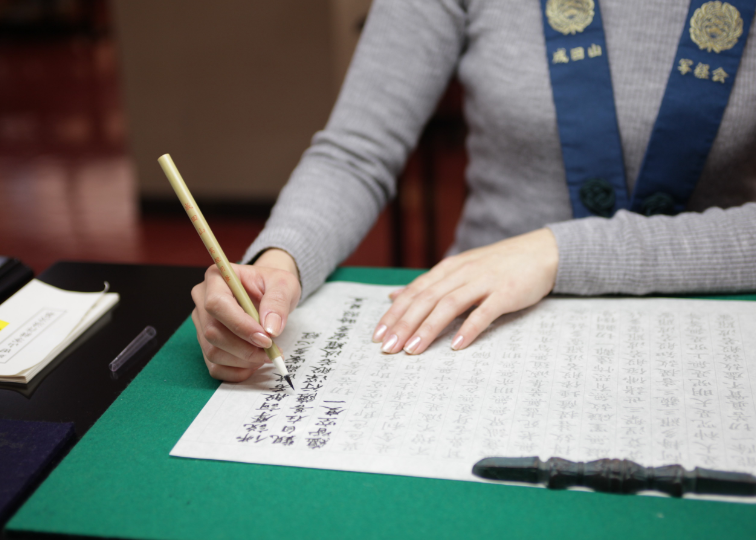 There is also a temple where you can experience the Buddhist practice of shakyo, or copying of sutras by hand using a brush. Whichever you decide, Japan’s art is sure to make an impression. Kawamura Memorial DIC Museum of Art, in Sakura City, features paintings by artists like Rembrandt, Monet, and Renoir and extends to American art of the latter half of the twentieth century. 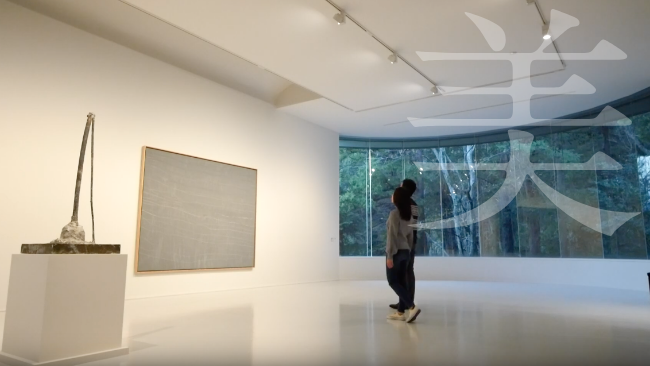 With architecture designed to complement the exhibits and a garden where visitors can enjoy the changing of the seasons, Kawamura Memorial DIC Museum of Art harmonizes the three elements of art, architecture, and nature. Inside, one can relax with a bowl of matcha and seasonal Japanese sweets. The museum is easily accessible from Narita Airport by taking a free shuttle bus from Keisei/JR Sakura station. Admission: 1000 yen for adults; 800 yen for college students and seniors over 65; 600 yen for elementary, middle school and high school students; admission cost is different during special exhibits. Called shakyo, sutra copying is a form of meditation not unlike the chanting of a sutra. At Narita you can try this unique experience at the Great Peace Pagoda located in Naritasan Park. Select from two different sutras: the ten-character Gohogo sutra (1000 yen, approximately 15 minutes required) or the Heart Sutra (2000 yen, between 1 and 2 hours required). Reservations are not necessary. Located in Narita City’s spacious Naritasan Park, the Naritasan Calligraphy Museum houses a collection of more than 6,000 works of calligraphy, including Japanese writing over 800 years old, Chinese rubbings, and many other pieces of calligraphy art, with a special focus on works from the Edo Period to the present.